With windows Arena was great for debugging, since I could see all the input and output. I have started a new project, my first one on a macintosh, and find it awkward to debug things like doing moves, undoing moves, move generation, etc. without my Arena crutch. Does anyone know of something similar I could use? I have tried xboard, stockfish, and the shredder demo and none seem to provide the same convenience. There's Sigma Chess, but I switched to using XBoard myself. I never used any of the other options you mention. Could you elaborate on what exactly it is that Arena does? Is it that you can see the engine-GUI traffic real time? Wit XBoard you can do that, by setting the debug file to stderr. Then all debug output, which includes all time-stamped engine traffic, appears in the xterm from which you started it. Of course you could pipe stderr to some filter, to pass only lines that contain 'first' or 'second', to be somewhat more selective. If you want to see what the UCI traffic, you could can use UCIWB as adapter in stead of Polyglot, as it relays all the raw engine input to the GUI as debug statements, so they appear in the XBoard debug file. Evert wrote: There's Sigma Chess, but I switched to using XBoard myself. I never used any of the other options you mention. As far as I can tell, Sigma chess does not work on the most recent mac os since it does not support powerpc applications. I am not sure you get to see all the UCI traffic either. hgm wrote: Could you elaborate on what exactly it is that Arena does? Is it that you can see the engine-GUI traffic real time? Wit XBoard you can do that, by setting the debug file to stderr. Then all debug output, which includes all time-stamped engine traffic, appears in the xterm from which you started it. I want to see all the UCI traffic. I did download XBoard and managed to get it running via command line (for some reason changing the config files to get rid of fairymax references did not work, so double clicking the XBoard app would always just generate a no-fairymax error). I have not used unix since grad school (aka for a LONG time) so all the fiddling I was doing trying to get it working was a bit discouraging. I never tried polyglot since after spending an hour getting board installed and working with Arasan I was getting a little depressed about the process. It sounds like UCIWB would be an ideal solution, is there a mac/unix version? Are there easy to follow instructions for a dumb manager type (as opposed to a super-star unix programmer)? I have a program I wrote for Linux ("Gestor") that keeps record of all traffic (inspired on an adapter HGM wrote for Micromax). I guess it should compile for Mac. If you find it useful, I can send it to you or better yet, release it. I will look it up tonight at home. UCI2WB is open source, ( http://hgm.nubati.net/cgi-bin/gitweb.cgi ), and compiles on Windows as well as Linux. I suppose you should haev no difficulty compiling it for Mac. The easiest way to get rid of the fairymax error message is to actually install fairymax. I am not sure things like "apt-get install" work on a Mac-Intosh, but the XBoard binary package for Mac that is available from WinBoard forum should come with Fairy-Max pre-installed. (And probably also Mac binaries for Polyglot and UCI2WB). Another way would be to edit the master settings file (on Linux /etc/xboard.conf) and change the -firstChessProgram setting from fairymax to another engine, or define -ncp mode to start without engine. 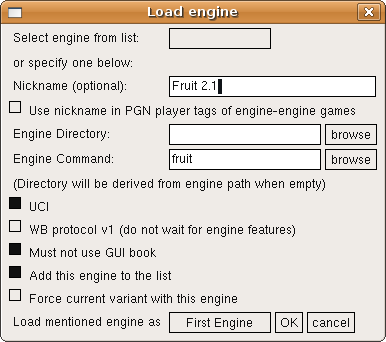 xboard -fcp "UCI2WB ENGINECOMMAND ENGINEFOLDER"
xboard -adapterCommand "UCI2WB %fcp %fd"
You could also just startup XBoard, select Engine->Load Engine, type "fruit" for engine command, tick UCI, and click OK to load Fruit (and next time you could then select it in that same dialog from the combobox). The debug output should then appear in the terminal window. BubbaTough wrote: As far as I can tell, Sigma chess does not work on the most recent mac os since it does not support powerpc applications. I am not sure you get to see all the UCI traffic either. I write my own log file with all incoming and outgoing commands. Does the job. We hope to have a native Mac version of XBoard (tentative name 'OSXBoard') soon. I have just seen a screenshot, and it already displays the board and clocks! hgm wrote: We hope to have a native Mac version of XBoard (tentative name 'OSXBoard') soon. I have just seen a screenshot, and it already displays the board and clocks! Launch of "timestamp" failed&#58; the PowerPC architecture is no longer supported.